The company is a well distinguished name for the exporting and providing services for Natural Quartz Stone. Commitment with purity is the source of motivation for us. 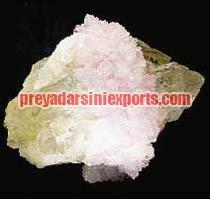 We are one of the leading White Quartz Stones Exporters in India. We have carved a niche for ourselves in the market by delivering not only high quality Quartz Stone but also customer satisfaction. Our delivery chain ensures timely delivery of Quartz Stone. We have large ware houses to store and support bulk orders.